So what do we really want? Sure, a teddy bear holding a heart is cute and all, but there are things out there that we would LOVE for Valentine’s Day (or any day!). The following gift ideas are perfect for your girlfriend, wife, mom, daughter, or bestie and there are presents in all price ranges! Rocker Rags launched in 2010, by true fans of rock and roll. 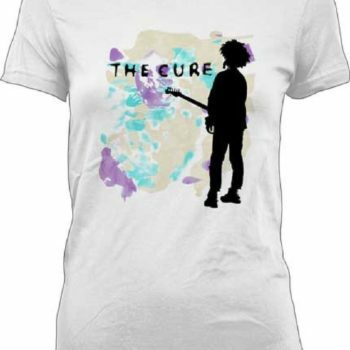 We feature rock t-shirts, sweatshirts, hats and other products from most genres of rock music including classic rock, hard rock, punk rock, new wave, heavy metal, and alternative rock/grunge. Have a loved one consistently distracted by the bright light of smartphone screens? Give them a gift that will help them slow their breath and quiet their minds! Suffering from anxiety, the founders of Komuso Design searched for a meaningful solution – instead of mindlessly scrolling through their phones to distract their minds. 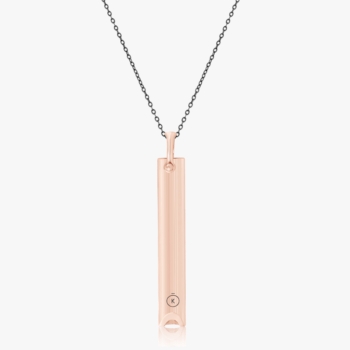 Controlling the state of our mind through breath, Komuso Design combines ancient wisdom and modern science to not only revolutionize jewelry, but to battle anxiety and improve on meditation. Is she sick and tired of Old Man Winter? Pinkly Perfect is for ladies who dream of their toes in the sand and warm sun on their face all year! Buy a Pinkly Perfect beach bag andstuff it with all kinds of their beachy chic goodies like a soft off theshoulder sweatshirt, a tank for when it warms up and adorable accessory pouches to hold cosmetics & essentials with phrases like You’re Perfect and It’s Summer Somewhere. 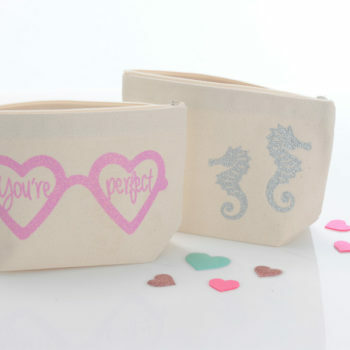 Pinkly Perfect also makes charitable bracelets and keychains. Made inthe USA. Shop Pinkly Perfect at: https://www.pinklyperfect.com. Send a secret message to a special someone in abeautiful candle! 54 Celsius makes SecretMessage Candles. As the wax melts, it becomes translucent, revealing themessage inside in 2-3 hours. 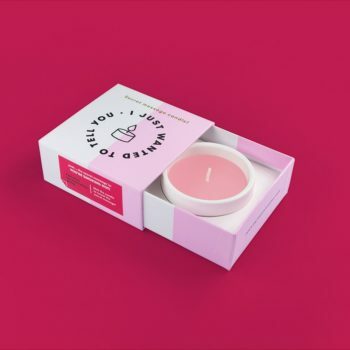 Eight messages to choose from such as “You Light My Fire,” “You Are Smoking Hot,” and “You Light Up EveryRoom.” Candles are lightly scented. $15.00 at https://us.54celsius.com and select Nordstrom stores. 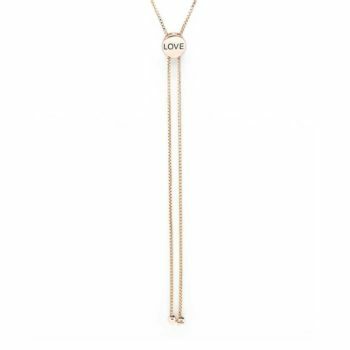 The Love Rose Gold Bolo AdjustableNecklace from KIS Jewelry is the perfect stylish sentiment for Valentine’s Day. 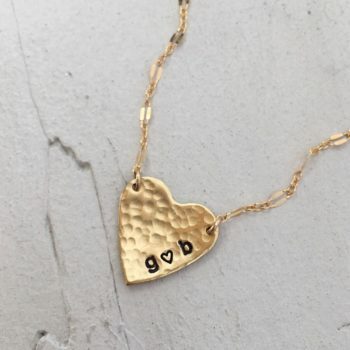 This necklace will be the most versatile piece in her jewelry box. Not only is this bolo adjustable, it’s also reversible! Slide the pave’ crystal centerpiece up or down along the delicate chain to wear as a choker, Y necklace or a long fashion statement. Transform the look from glitzy to casual by flipping the necklace over to reveal the inspirational word Love. Go from work to weekend in a snap! Adjustable from short up to 25″, perfect for layering. Pale rose gold plating. Available for $24 at www.KIS-Jewelry.com. 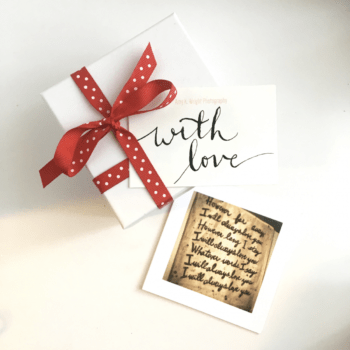 Among all the texts and tweets, send them a meaningful handwritten message with the original line of modern photo greeting cards from Tell It Well Cards! Each card is 4 x 4 square (polaroid size) and is printed on sustainably sourced and recycled paper that is certified by the Forest Stewardship Council. 10% of sales will go to provide small business microloans to women in poverty in the US and around the world. Learn more at www.wholeplanetfoundation.org. Who says Valentine’s Day is just for boyfriends and girlfriends? 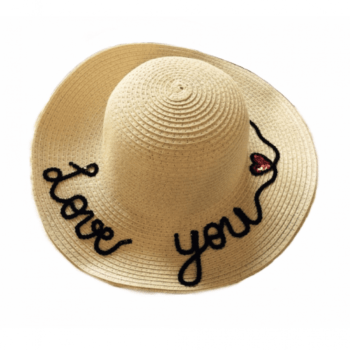 Treat yourself and your special kiddo to some matching “Love You” straw hats from ModerneChild! So on trend and perfect for your pool/beach days coming up with your little fashion maven! The writing is in a pretty black sequin and a cute red sequin heart at the end. ModerneChild Shoppe’s mommy and me matching outfits are in high demand from celebs like Tori Spelling and Amanda Stanton, and now you can get the same looks at an affordable price. Get ready for picture perfect photo sessions! 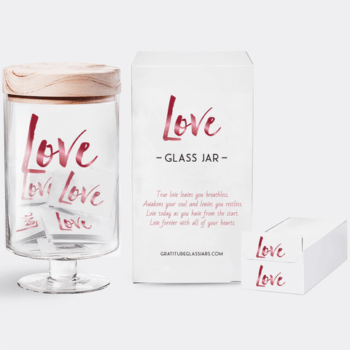 Show your friends and family how much you care with the Gratitude Glass Love Jar. Fill the jar up with love notes that can be enjoyed all year long! Named “the gift that keeps on giving” by Oprah and featured among the 102 gifts of Oprah’s Favorite Things 2017 List, the Gratitude Jar from Gratitude Glass Jars has driven a movement – inspiring others to love themselves and the people around them. 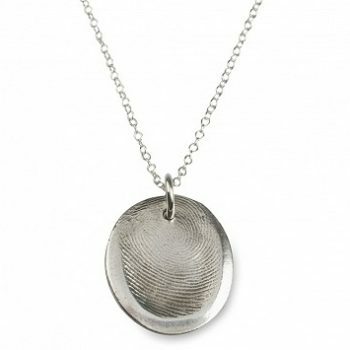 Give your special someone a piece of jewelry that also inspires change and restores dignity! 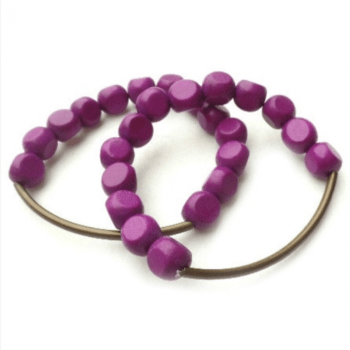 Béljoy is a distinct line of handcrafted jewelry produced in Haiti + the US by local artisans. Béljoy offers men + women in Haiti the opportunity to earn a dignified and consistent wage through the art of jewelry making. By teaching this trade and paying a superior wage, we hope to encourage women and empower them to provide for their families. They are committed to the local sourcing of jewelry components like clay, paper beads, and horn. 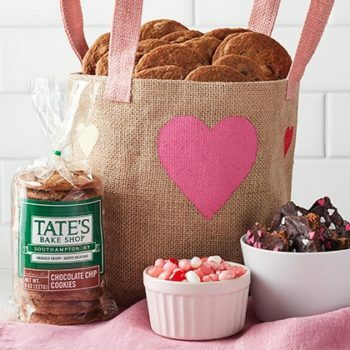 This adorable reusable burlap tote is filled with gourmet Valentine’s Day treats for your Valentine. It’s a great gift for the grandkids too! Make their day perfect and sweet with Tate’s signature chocolate chip cookies, out of this world Valentine’s Day cookie bark, and a bag of Jelly Belly Valentine’s Day jelly beans.